The Best Breakfast Casserole is simple to make and makes the perfect breakfast or dinner. Made with sausage, peppers, onions, and shredded hash brown. It’s easy to prepare and taste great. Breakfast, lunch, dinner, there is no wrong time to serve this recipe! It really is The Best Breakfast Casserole. 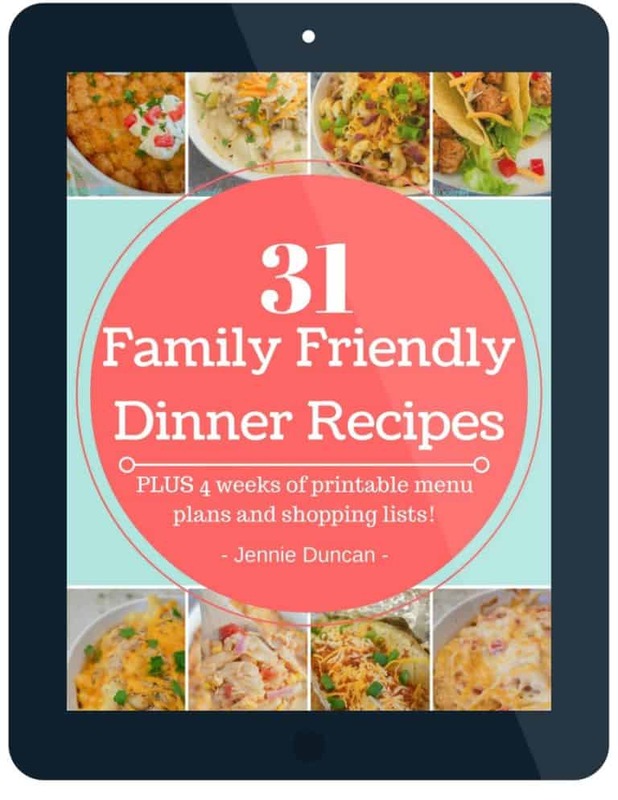 My entire family loves it and it’s so easy to prepare. Mix up all your ingredients and then pop it in the oven until done. If you love a good breakfast casserole as much as I do then you have to check out the rest of them on the blog. Start by preheating your oven to 350 degrees. Prepare a casserole dish with no-stick cooking spray. Now ground and cook sausage in a skillet until fully cooked. Drain fat then add in your garlic, diced peppers, and diced onions to the skillet and sauté with sausage for 2 minutes. Place all of this in your prepared baking dish. Then add the frozen shredded hash browns and 1/2 cup shredded cheese to the casserole dish with sausage and mix it together. Whisk eggs together with salt and pepper. Pour eggs over ingredients in baking dish and gently mix to make sure eggs are covering the entire dish. Top with cheese and bake for 45 minutes or until a fork can come out clean and eggs are cooked all the way through. It’s not just for breakfast! I love serving this casserole with dinner with a salad or veggies. We usually have leftovers that we will have for breakfast with yogurt or fruit on the side. 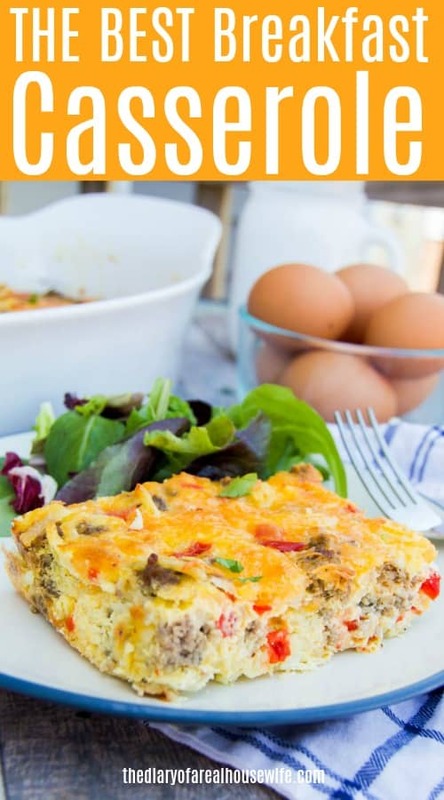 Low Carb Egg Casserole: This recipe is so simple to make yet one of my all-time favorites. It’s a must try. Three Cheese Breakfast Casserole: Anything with cheese is going to be a winner with me and this recipe is loaded! Biscuits and Gravy Breakfast Casserole: My all-time favorite breakfast in casserole form. 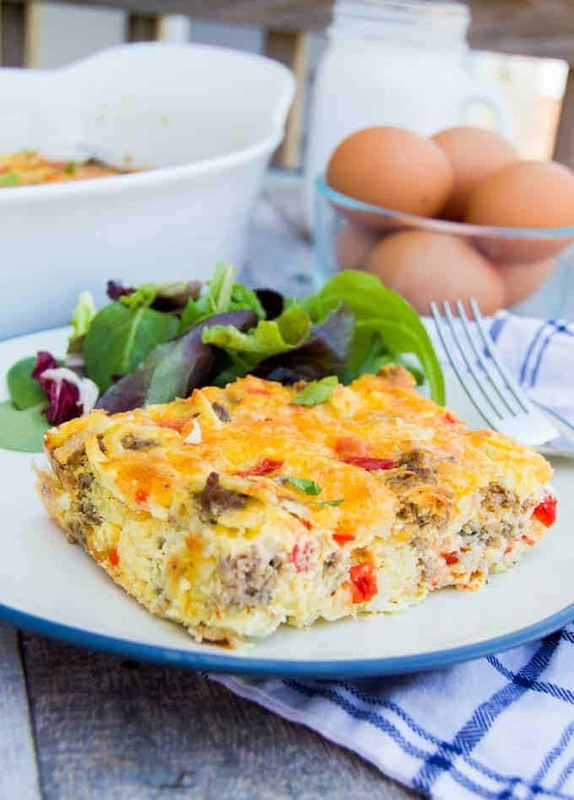 This Breakfast Casserole is a classic! 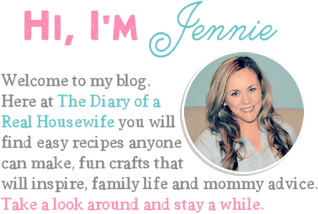 It's my go-to recipe and a family favorite. It's made with ground sausage and hashbrown then baked. Preheat oven to 350 degrees. Prepare a casserole dish with no-stick cooking spray. Ground and cook sausage in a skillet until fully cooked. Add garlic, peppers, and onions to the skillet and sauté with sausage for 2 minutes. Place this in your prepared baking dish. Add frozen shredded hash browns and 1/2 cup shredded cheese to the casserole dish with sausage. Mix together. Whisk eggs together with salt and pepper. Pour eggs over ingredients in baking dish and gently mix to make sure eggs are covering the entire dish. Top with cheese and bake for 45 minutes or until a fork can come out clean and eggs are cooked all the way through. Optional: for picture purposed I added fresh parsley for a garnish. Looks scumptious! I’m making that this weekend! What a yummy recipe! I love breakfast casseroles that can be made the night before. I’ll have to give this a try! Yum, this looks so good! 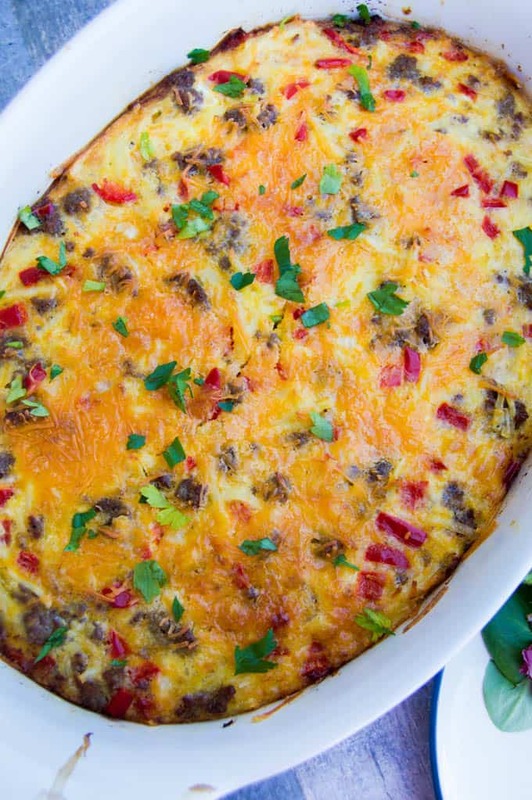 Can’t wait to try this — I love a good breakfast casserole! 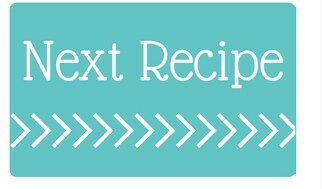 Do you put nutritional values on your recipes?